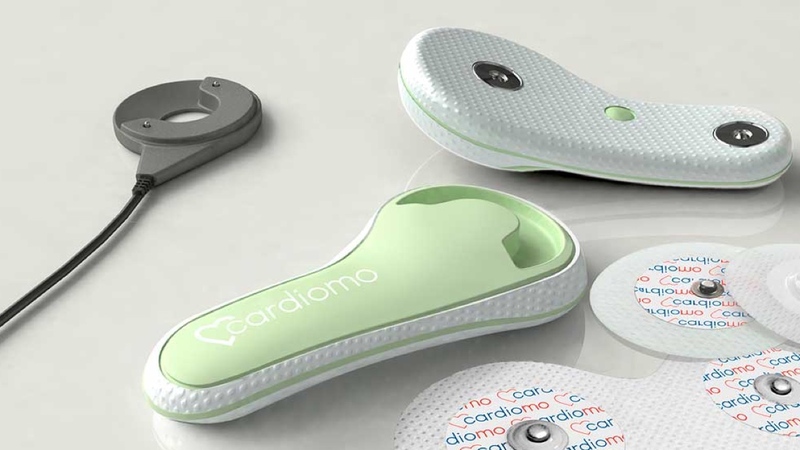 There's not always a great story behind every new piece of wearable tech we encounter, but in the case of the Cardiomo, a stick-on wearable that promises to detect heart problems, CEO Roman Belkin took inspiration from something close to his heart. Belkin has been working on this project for less than two years and told us that the worries over his own mother's health helped inspire the smart patch that looks very similar to devices we've seen and tried before like the SenseOn heart rate monitor. The Cardiomo device is made for the older generation like Belkin's mother, but he told us that the waterproof device could be used by younger, fitter users, to even deliver heart rate readings while swimming. It can of course be worn in the shower as well. Inside lies a ECG standard heart rate monitor, respiration sensors and electrodes that sit against the skin below the heart to ensure accurate readings. There's also the kind of 3-axis motion sensor setup you'd expect to find tracking movement inside of a Fitbit. That data is sent wirelessly to your phone and analysed using a AI-powered software that has been developed with cardiologists. Then a deeper analysis is conducted in the cloud to provide feedback. That could be in the form of recommendations to keep your heart healthy, but it could even suggest that you see your doctor urgently. It can send out an alarm message to relatives, caregivers and doctors if the user doesn't respond to advice. The Cardiomo team believes it can recognise and alert up to 40 diseases including strokes and heart attacks. As well as heart rate, it also delivers breathing rate and skin temperature data and with 10 days of battery life, it's offering more stamina than the current crop of connected patches available. It's up for pre-order right now and will cost $200 with a $10 monthly subscription to benefit from the analysis. It will initially be available for $100 if you jump in early. If it works as well as the team says it does, it could well end up being a real life saver.